The average age of passenger cars in Slovenia increased from 6.8 years in 1992 to 9.4 years in 2014. The structure of passenger cars by age changed as well. The number of passenger cars older than 12 years more than doubled in 2015 in comparison to 2001. Also, the share of passenger cars aged less than three years decreased by almost a half during this period. 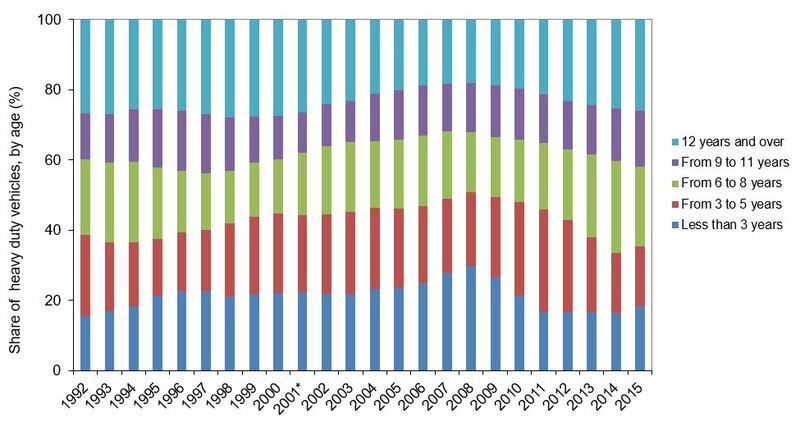 The share of heavy duty vehicles and the share of mopeds and motorcycles older than 12 years has also increased since 2009, while the share of these vehicles under three years of age decreased in the same period. This means that new technologies are being introduced slowly. As a result, the Slovenian vehicle fleet is generally less environmentally-friendly than it used to be. Similarly as in the EU-27, the average age of passenger cars has increased from 6.8 years in 2000 to 7.4 years in 2014. As drivers in the EU tend to hold on to their vehicles longer than in the past, the average age of the vehicle fleet is increasing. This indicator shows the average age of passenger cars in the period 1992–2014 and the age structure of passenger cars in the period 1992–2015 in Slovenia. 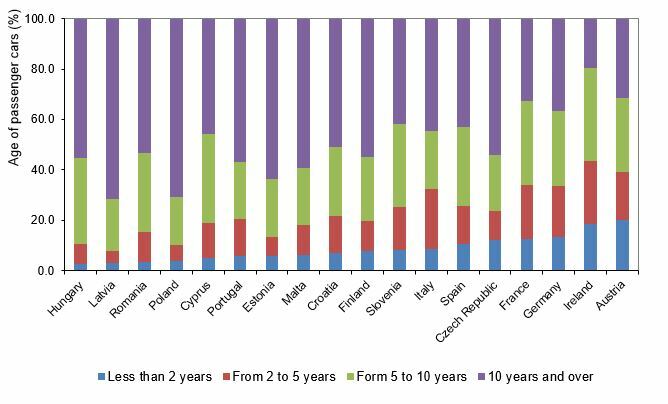 The age structure of passenger cars for selected European countries is shown for 2012. The indicator also shows the age structure of heavy duty vehicles and buses in the period 1992–2015 and the age structure of mopeds and motorcycles in the period 2002–2015 in Slovenia. Environmental and safety standards of vehicles are constantly improving; therefore, newer vehicles are, on average, safer, less polluting, generate less noise and consume less fuel. Therefore, the indicator of average age and the age structure of passenger cars indirectly expresses their environmental efficiency. EUROSTAT, Passenger cars by age, 2015. No specific target for the average age of the vehicle fleet has been set. The goals pertaining to the vehicle fleet are thus mostly related to its structure. From an environmental perspective, it is especially important that old vehicles are replaced with new ones that are technologically more advanced and environmentally friendly. To this purpose, the EU adopted new legislation framework that defines limit values for exhaust emissions (emissions at source). This lead to the introduction of EURO standards that contributed significantly to the reduction of negative impacts of transport on the environment in the recent decade, particularly from the perspective of emissions from vehicles. Directive 2000/53/EC of the European Parliament and of the Council on end-of-life vehicles (ELV Directive) partially regulates the management of end-of-life vehicles. In addition to incentives to limit the use of (heavy) metals in the car industry, the Directive sets a target according to which the EU Member States are to increase the share of recycled and reused and recovered vehicles to 95% by 2015. The average age of a vehicle fleet is an indirect indicator of the effectiveness of meeting environmental goals and preventing negative impacts of road transport on the environment (EEA, 2016). 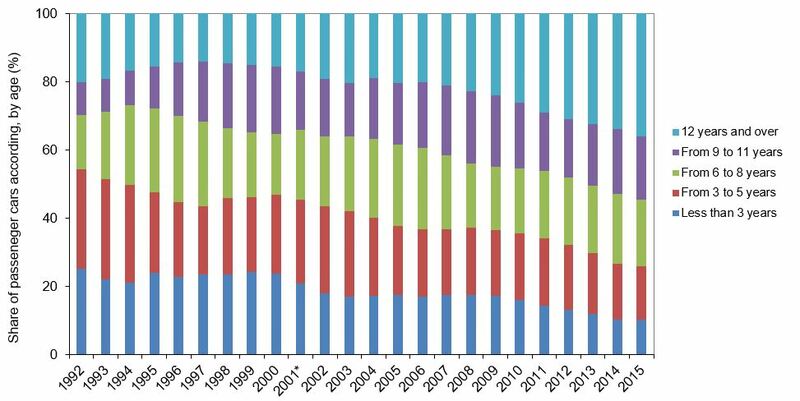 Older vehicle fleets generate more emissions than younger ones; however, more rapid vehicle replacement has the disadvantage of increasing the amounts of energy and materials used for vehicle construction, dismantling and recycling. According to the EEA, the information on the average age of a vehicle fleet alone is not sufficient to assess its overall environmental performance. Additional understanding of the phenomenon would require, at least, information on the average number of kilometres travelled by vehicles, and the average expected vehicle lifetime (EEA, 2016) as well as information on meeting emission standards by vehicle category. The average age of passenger cars in the EU decreased from 8.8 years in 1995 to 8.2 years in 2009 and 7.4 years in 2014, which is 8% more than in 2000, when the average age of passenger cars was 6.8 years. Compared to past years, car owners in the EU now wait longer to replace older passenger cars with new ones, which results in an older average age of the vehicle fleet in the EU. Namely, the share of passenger cars older than 10 years has been constantly increasing (EEA, 2016). The average age of passenger cars in the EU-27 (Croatia is not included) varies widely between individual countries. It is highest in Slovakia, with 11.3 years (in 2012). Estonia (average age of 11 years) has a relatively old vehicle fleet as well. It is followed by Spain (9.86 years) and Finland (9.69 years). On the other hand, Poland (average age of 5.75 years), the United Kingdom (5.76 years) and Belgium (6.14 years) have much younger vehicle fleets. In 2012, the highest share of vehicles older than 10 years were registered in Latvia (71.7%) and Poland (70.7%), while the highest share of vehicles younger than 2 years was registered in Austria (20.1%) and Ireland (18.7%). The average age of diesel-powered passenger cars is lower than the average age of petrol-powered cars. The market of diesel-powered passenger cars has been constantly expanding. In the EU, more diesel-powered cars are registered each year than petrol-powered cars (EEA, 2016). In some EU countries, the average age of passenger cars is decreasing due to scrappage schemes, financial incentives, and mandatory periodical inspection and maintenance schemes (EEA, 2016). 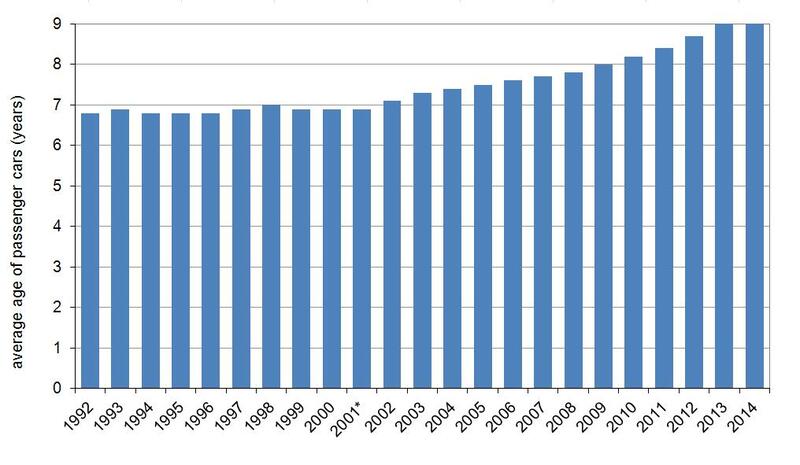 In Slovenia, the average age of passenger cars increased by 2.5 years between 1998 (6.9 years) and 2014 (9.4 years). 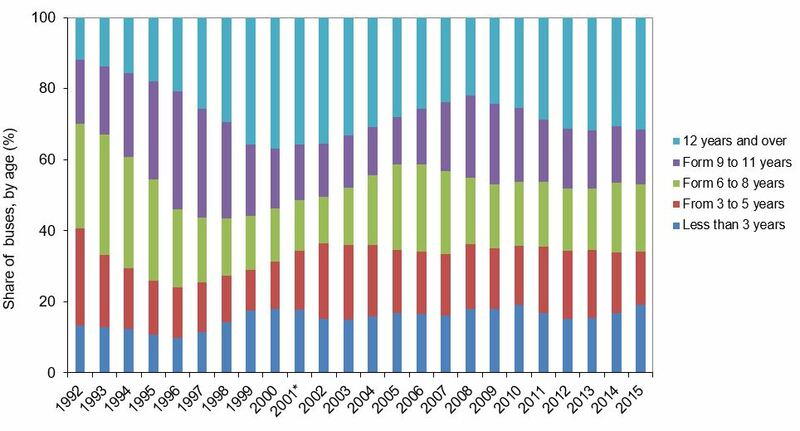 The age structure of passenger cars changed as well: in 2015, the share of cars older than 12 years more than doubled compared to 2001, while the share of cars less than 3 years old almost halved. This means that new technologies are being introduced gradually and that the vehicle fleet is mostly less environmentally-friendly. Interestingly, in 2015, 66% of passenger cars registered in Slovenia for the first time were new, while in 2011 only 86.9% were new (Statistical Office of the Republic of Slovenia, 2015). This means that new technologies are being introduced slowly and that most of the vehicle fleet is environmentally less friendly. Unlike the average age of passenger cars, the average age of other types of vehicles in the EU increased in the period 2000–2014. 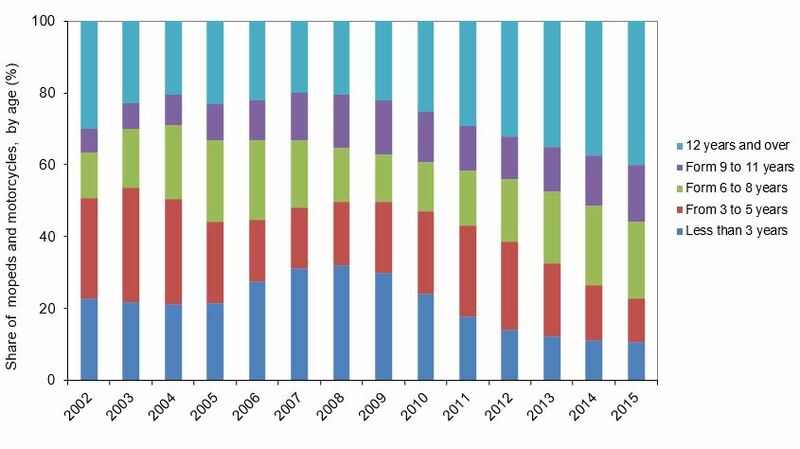 The average age of light commercial vehicles in the EU increased from 6.6 to 8.5 years in the period 2000–2014, while the average age of heavy duty vehicles increased from 7.5 to 8.1 years in the same period. The average age of motorcycles (from 8.9 to 9 years) and buses (from 8.7 to 9.4 years) also increased in the same period (EEA, 2016). In recent years, and especially from 2009 onwards, the trend has been similar in Slovenia: the share of mopeds and motorcycles older than 12 years has been increasing, while the growth in the number of such vehicles that are less than 3 years old has been stagnant or decreasing slightly. The share of mopeds and motorcycles less than 3 years old has been decreasing since 2010. Within the same period, the share of freight motor vehicles less than 3 years old has remained more or less the same. In 2015, the share of freight motor vehicles up to 3 years old slightly increased when compared to 2014 (from 16.5% in 2014 to 18.4% in 2015). The share of buses less than 3 years old has been increasing recently (particularly after 2012), from 15.3% in 2012 to 19.2% in 2015. On the other hand, the share of buses older than 12 years remained relatively stable in the period 2012–2015 (between 30.7% and 31.8%). Although several incentive systems for vehicle fleet renewal have been introduced in individual EU countries, there is no common policy at the EU level. Incentives may include financial compensation for scrapping old vehicles without the mandatory purchase of new ones or compensation for replacement of old vehicles with new or less polluting ones. Some indirect scrappage incentives (administrative measures) with no direct financial effects also exist. Although no such incentives have been introduced so far at the national level in Slovenia, some manufacturers have included them in their sales campaigns. These measures influence the environment in two ways: positively by reducing the environmental pressure and human health risks due to the renewal of the existing vehicle fleet with newer, technologically more advanced and cleaner vehicles; and negatively by reducing the lifetime of vehicles, increasing the amounts of energy and materials used for the construction of new vehicles and the dismantling of older ones. An environmentally important part of vehicle fleet renewal is the management system of end-of-life vehicles, which is mandatory for all EU Member States on the basis of the Directive on end-of-life vehicles of 18 September 2000 (no. 2000/53/EC). The target share of reuse and recovery for 2015 is 95%. Slovenia regulated this area by adopting the Decree on the manner, subject of and conditions for performing public utility service of the management of end-of-life vehicles (Official Gazette of the Republic of Slovenia, No. 18/03 and amendments), which was replaced by the new Decree on end-of-life vehicles (Official Gazette of the Republic of Slovenia, No. 32/11, 45/11 and 26/12). Regular roadworthiness tests are of major importance for the reduction of the environmental impacts of vehicles and for the timely abandonment of inappropriate vehicles. Properly maintained vehicles can be older as long as their environmental performance does not differ too much from newer vehicles, which are mostly related to compliance with EURO standards (emission limits for vehicles) (EEA, 2016). Mandatory periodic roadworthiness tests in Slovenia have been carried out for a long time. As of 1 December 2003, they also include measurements of exhaust gas emissions. This measure shall directly reduce GHG emissions, as cars are not allowed to exceed the approved values of these emissions. Furthermore, the measure shall also influence the maintenance of vehicles, which additionally contributes to the reduction of emissions.